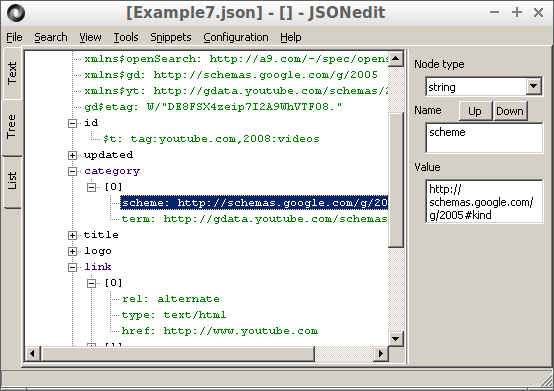 JSONedit is a simple JSON editor with text, tree and list view. Complete application (single executable file) weights about 2 MB (statically linked Lua and Scintilla included), does not require installation and does not depend on any non-standard dll. Settings are stored in .ini file created in application directory, so you can call it portable. Limitations: no Unicode support. Keep in mind that UTF-8 text with characters limited to 0x00 to 0x7F codes (7-bit) is equivalent to ASCII. Also, if you're using additional characters from single codepage only (your Windows default), then external to/from Unicode converter might come to help. Note: UTF-8 support is present in test version 0.10. License: freeware (free as in beer). Scroll page down for downloads. added dialog to change parent type when trying to add child to node other than array or object. added find in text function for text editor view. added some trivial node moving through "drag and drop". added "Expand all" and "Collapse all" to tree context menu. added searching inside tree (comparing with node names, node values or both); float values are matched with 1% accuracy margin. root node is expanded when parsing new text. minor fixes: renaming moved node parent subnodes on "drag and drop" (keeping array elements index text consistent with real index), checking if there is no duplicated node name when copying/moving nodes, set minimal width and height of main window, set anchoring for node name/value edit fields. 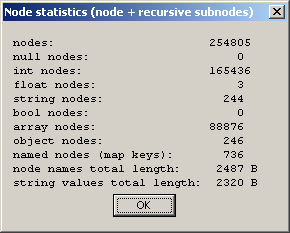 added simple node + its subnodes statistics (intended to help with memory usage estimation for DOM parser). FIXED: incorrect int/float node values when node type was changed to int/float and node value was not a valid number; falling back to previous type if invalid node value was not corrected. 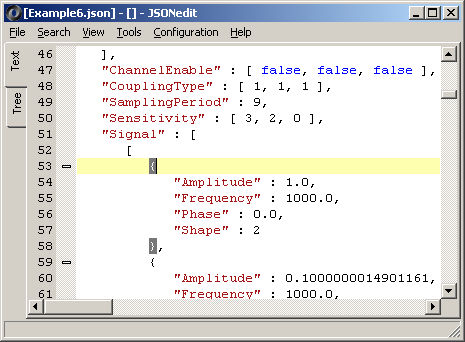 added JSON examples to Help menu: examples from json.org, miniscope v4/sig_test.dll configuration and gdata.youtube.com search query result. node names edited as multiline - most likely not useful, but allows testing import of CSV files with newlines inside quoted fields. FIXED: when unparseable text was pasted with "Paste as root from clipboard" RMB menu option few times it was multiplied in text editor. 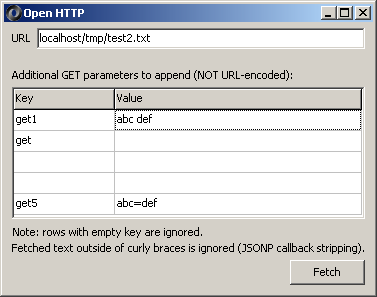 added simple HTTP client with JSONP callback stripping (thanks to Tielman de Villiers for the suggestion). added few shortcuts (Ctrl+S, Ctrl+Shift+S, Ctrl+N, Ctrl+O), thanks to Martin for the suggestion. added option to keep names of the nodes copied through clipboard (additional JSON wrapper is holding node name); by default copy/paste still uses plain JSON representing node; thanks to Peter for the suggestion. This option is limited to copying from/to JSONedit. If two JSONedit instances are used as source and destination it has to be enabled in both instances to work correctly. fixes related to multi-monitor environments: Position changed to poOwnerFormCenter, modified standard dialogs behavior; thanks to Peter for the suggestion. added array generator using embedded Lua interpreter. changed text editor from TRichEdit to Scintilla - syntax highlighting, code folding, braces matching, line numbering. This is relatively big change, so in case of problem - as always - try previous version. FIXED: document content was reverted back when "Reformat" was used after new text was entered in text mode. It was hidden if view was switched to tree. Thanks to Dan Hersam for the report. tree editing panel width is stored in configuration. added partial font selection (for tree control, for Scintilla text editor and for editing controls) as suggested by Sungwook. 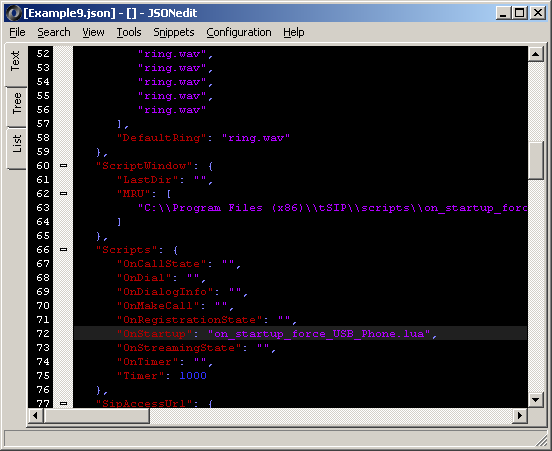 2013.04.04 Added ListJson.wlx - JSON viewer plugin for Total Commander (32-bit only) based on JSONedit code. Function set is limited and I believe only usage of this plugin would be Total Commander Quick View function (Ctrl+Q). new option for JSON parsing: treating control characters (U+0000 through U+001F) inside strings as errors (stricter parsing - suggestion from Michael). tree view: assigned Ctrl+C (copy node) and Ctrl+V (paste as child) shortcuts. tree view: null value is shown in same way as true/false. Scintilla caret width increased to 2 pixels. resized "About" window for better license texts readability. for boolean value "0" and "1" are accepted as well as "false" and "true"
list view: added Ctrl+T as shortcut for "Go to tree"